Bristol Street Motors has decided to invest £200,000 in refurbishing its Ilkeston Nissan dealership, Car Dealer magazine reports. The dealership chain, owned by the Vertu Motors plc, has chosen the Derby Road site to be the next showroom to receive its continued investment in its network of dealerships across the country. The refurbishment comes on the back of significant work to bring the Derby Road location up to Nissan’s new corporate standards. This included installing a state-of-the-art customer experience environment, which helped it make the top 25 Nissan dealerships in the country for aftersales. Jon Battison, the general manager at Nissan Ilkeston, said: “The latest investment proves Bristol Street Motors’ continued dedication to Nissan, as well as the Ilkeston community. "As a result of our established presence in the region, we have cultivated a loyal customer base who have faith in our ability to deliver outstanding customer service to all our customers. “The new showroom and sales facilities provide an enhanced working environment for our colleagues and allow them to continue providing the best possible buying experience for both new and returning customers. 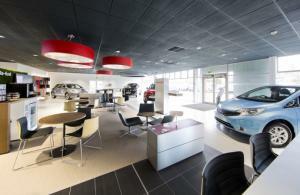 “At Bristol Street Motors, we believe that by transforming our dealerships into comfortable and welcoming places, we can ensure every customer has a positive sales experience."